One of the most difficult challenge of learning to drive is the correct operation of the clutch, which we know as clutch control. Many learners opt to take an automatic driving test to alleviate the stress of having to operate the clutch. A significant problem with many learner drivers is lack of preparation by not looking at what is happening in front. For example if you have stopped in traffic, a learner will often wait till the car directly in front starts to move before they think about operating the clutch. Ideally they need to be looking further ahead for signs that the traffic has started to move and to get themselves prepared to move. This lack of preparation leads to stress as they think that they are holding everyone up behind them. As a result, they will operate the clutch too quickly which often ends in stalling the car. Explained is the basic function of a clutch, how to use a car clutch along with hill starts. To gain a better understanding of clutch control, you need a basic understanding of how a clutch works. A car engine, even on tick-over is constantly spinning. A clutch separates the car wheels from the engine. If the car wheels where permanently linked to the engine, it wouldn’t be possible to stop the car without the engine stalling. Without a clutch, it would also be very difficult for the car to move off from a stationary position. A clutch also enables you to change gear. 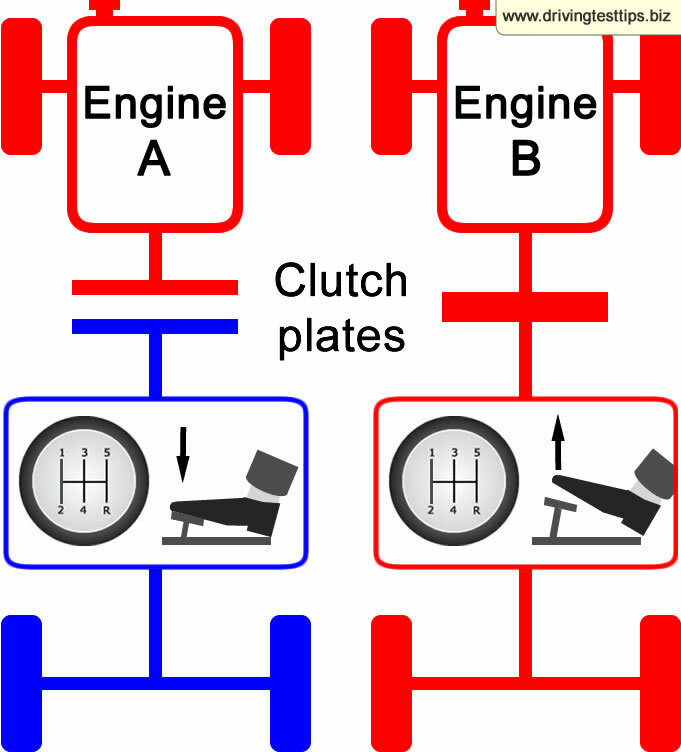 In the diagram provided, we can see the two plates that represent the clutch. Engine A has the clutch pedal depressed to the floor, which in turn separates the clutch friction plates. When the clutch plates are separated, it disconnects the car engine from the wheels, which also prevents any power to the wheels. One of the clutch plates is still spinning along with the engine, as the engine is constantly spinning. A gear is then selected. Now that the car is in-gear, the clutch pedal needs to be raised, which in turn brings the clutch plates together. When moving off from a stationary position using 1st gear, lifting the clutch pedal slowly allows the clutch plates to come together slowly. This allows the plates to slip and allow the car to move off smoothly until they are tightly pressed together, joining the broken link between the wheels and the engine. Clutch control is a technique that allows a driver to control a cars speed. Learning clutch control is essential for passing the driving test as you may be required to demonstrate hill starts to the driving examiner, plus the driving manoeuvres require a high level of clutch control by keeping the car incredibly slow. Learning clutch control for the first time should be done on a flat, even and quiet road. Ensure the car is setup correctly so that you can depress the clutch fully without overstretching, you are wearing your seat belt, the engine is turned on and the handbrake is OFF. Depress the clutch fully and select first gear. Provide the engine with a little extra power by very gently pressing the accelerator so that the rev counter reads around 1500 rpm. Ensure before your car moves that it is safe to do so and now very slowly, raise the clutch. When the clutch plates just start to meet, this is called the clutch bite point. You will know it’s the bite point at the car will slowly start to move. The clutch bite point can occur at any point during the clutches working travel as you lift it, as all clutches are different. The bite point however will always be in the same place for that particular clutch. The key here is with plenty of practice is to remember where the bite point is. Now that we have found the bite point, the car is slowly starting to move forward, now fully depress the clutch and gently brake to a stop. Keep repeating the process by giving the engine a little power and very slowly lifting the clutch till the car starts to move and fully depressing the clutch. By repeating this, you will gain an understanding where the bite point occurs. Once you have got the hang of that, try it again but instead of fully depressing the clutch once the car starts to move, press the clutch just a small amount; try and think the thickness of a one pound coin. By doing this you are slightly releasing the clutch plates, disengaging the wheels and letting the car slow down. As soon as the car has slowed slightly, lift the clutch around the thickness of a one pound coin again to move the car again. Essentially what you are trying to achieve is to keep the car moving but at the slowest possible speed. This technique is called slipping the clutch and is required to perform the driving manoeuvres on lessons and the driving test. Moving a car off quickly is the same technique as above except you will need to provide significantly more gas/revs to the engine. By providing more gas, in the region of 2500 rpm, you are able to bring the clutch up faster without fear of stalling. This will enable you to move the car off much faster in situations such as busy roundabouts and pulling out of junctions. Be a little cautious however as giving the car too much gas and releasing the clutch too fast may result inwheel spin. More advanced clutch control techniques will need to be mastered for holding the car steady on the clutch bite point. These techniques are important for safely moving a car off on a hill. Further information can be found in How to stop stalling a car. Apply the handbrake and select first gear. Provide the engine with a little extra power, again around 1500 rpm to 2000 rpm on the rev counter. Gently raise the clutch until you reach the bite point. You will know when you have the bite point as the car may creak a little or the bonnet may rise slightly as the car tries to move forward but cannot due to the handbrake being applied. Provided you have the clutch bite point, the car will not roll backwards when you release the handbrake. The hill starts tutorial explain how to move park up hill and downhill, plus how to correctly make hill starts and downhill starts in detail with the emphasis being on clutch control. Explained also are frequent mistakes learner drivers make during a driving test and how to avoid them. Automatic cars do not have clutches and instead use a device called a torque converter. A torque converter is a circular object that rotates with the engine and uses oil to drive the transmission which turns the wheels. As the engine spins faster more oil is released at higher pressures into the torque converter. Centrifugal force drives the oil onto fins, which provides the energy needed to the transmission. During driving lessons and the driving test, there will be plenty of occasions that you stop in traffic. Look well ahead for any indication that the traffic is starting to move. This can be traffic lights changing ahead or through other car windows. This will better prepare you to move the car off and less likely to stall. Some driving instructors teach learner drivers to keep the clutch bite point whilst waiting (same technique as clutch control on a hill). Whilst this may reduce the chances of stalling, it cause the clutch to wear at a much higher rate. Try to get into the habit of fully depressing the clutch while stationary and finding the bite point just before moving off. During the driving test, you will likely be taken through many different types of junctions. Often the most challenging are closed junction. A closed junction is very difficult to observe and approaching traffic as there are often obstacles blocking your view. These can be tree’s, bushes, fences etc. A high level of clutch control is required at these types of junctions as you will need the ability to move forward very slowly. Fractionally pressing the clutch just under the bite point to slow the car and lifting very slightly to move forward. The technique for Learning clutch control should be employed in such instances. Quick and constant observations should be made and the ability to quickly depress the clutch and brake if there is need to stop. Practice learning clutch control until you are confident you can move the car off in a reasonable time and without stalling. Slipping the clutch is referred to when the clutch is lowered and raised in the bite point area to keep the car moving slowly. Slipping the clutch is used when moving very slowly in traffic or when performing driving manoeuvres such as the turn in the road. Certain drivers may leave the car in gear and slip the clutch whilst stationary in traffic. This practice significantly increases wear on the clutch plates. Replacement clutches are expensive so if stationary in traffic either fully depress the clutch and apply the handbrake or if for a long period, place the gear lever into neutral and release the clutch. Whilst driving at a steady speed on a clear road, ideally the driver should remove their foot from resting on the clutch and place it on the foot well floor or a dead pedal (place to rest your foot) if the vehicle has one. If a driver rests the foot on the clutch whilst driving, this is referred to riding the clutch. Clutches contain a clutch release bearing which applies pressure to the pressure plates to aid releasing the clutch plates. Resting your foot on the clutch can cause wear on the release bearing and too much pressure can cause the plates themselves to slip, causing significant wear to the clutch plate friction material. This website is really very informative and provided lots of tips and best practices which can be used in real life situations by new drivers. Thank you very much for the useful content and keep up the good work. Thank you very much for the kind words and it’s great to know that the website is being of benefit to you. Great info. Really solved the doubts I had since the beginning. Keep posting such information about tge various aspects of driving or any other things that’ll help people understand the mechanisms more easily! What an amazing, informative, educative website. Driving schools should learn from here how to communicate about the art of driving in the simplest yet most effective way. Great job. Thank you for being on the web. I will be henceforth a regular visitor. Thanks for the comments Zquba, much appreciated. Yes, you’re right, I’ve always found the simplest way of explaining something is the most effective. Website very informative and really helpful especially for learner drivers. Explains everything clearly and in simple terms. Continue the good work, very much appreciated. Hello, is it posssible to fail if I use the clutch to early, but reasonably ? Yes you can fail the driving test if you depress the clutch too early (and consistently do it). This is called coasting and it means you have less control over the car. Providing you use the clutch around 10 metres or so from when you intend on stopping, this should be fine. For a better explanation, see coasting. I’m only self taught in manual driving and I always clutch coast mostly when stopping especially at major intersections and I admit I drive too fast. However, I’ve never seen it as an out-of-control action until I’ve read the articles on this website. REALLY very helpful. I hope now that I will not transfer these bad clutch habits to my son when I start showing him how to drive the van. THANK YOU VERY MUCH for writing these articles. Glad that the site has been helpful to you. I just found this site while looking to learn how to drive a manual car as I’m only used to automatic cars. But I’ve found really helpful information here, and I’m glad I found this site! Glad you have found it useful. If you have any questions about any part of the learning to drive process, simply ask in the comments section and we’ll do our best to help.